By purchasing our cookbooks you will contribute to our charitable aim and so reward us for all our efforts. For any inquiries about the books, please contact us via contact form or send an email to info@sila.si. The cookbook was successfully launched in October 2012 in Indian Restaurant Namaste. The owner Vesna Nisha Dolinar had not only provided the restaurant premises, but also lovely food and lassi made according to the recipes in the cookbook. Our thanks go to all SILA-IWCL members who shared their recipes and helped this cookbook come to existence.Special thanks go to Doroteja and Una who did an amazing job editing the cookbook, Veena Jerome who provided almost half of the recipes and invaluable advise, her daughter Karuna and Rebecca Ehalt for the design. The result is superb! 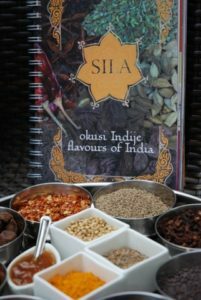 Each SILA-IWCL member provided a recipe that has been credited with her name and the country from which the recipe originates. Each recipe has its own style to capture rich voices of our members in their own unique way. Our thanks go to all SILA-IWCL members who shared their recipes and helped this cookbook come to existence and especially to members of the cookbook committee headed by Doroteja Omahen. Special thanks go toMetka Premel and Jelica Štemberger for proofreading the Slovene part, although they are not members of SILA-IWCL, they were very willing to help us. Thanks also to Alan McConnell-Duff and the British International School of Ljubljana for proofreading the English part. We could not have made it without our sponsors, who were ready to support us even at this time of global crisis. By helping us ti publish our books, they are helping the needy Slovenians who will benefit from the proceeds of our books sales. Thanks to Papirnica Goričane for the generous supply of paper and to our chosen printing workshop TISKARNA PLEŠKO d.o.o. from Medvode (Flavours of the world book), for a substantial discount on printing prices and all their efforts to make our cookbook a great book.